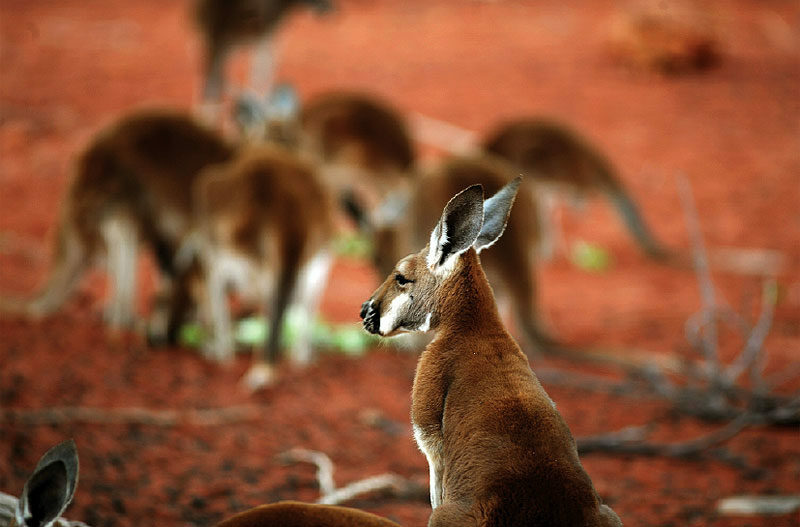 Aside from a source of food and clothing, roos were also used to help find valuable water caches. It’s grubs for dinner and honey ants for dessert as Ellen Hill samples her way through the Alice Springs Desert Park, a place where the hidden secrets of bush tucker and outback medicine are within easy reach. If only you knew where to look. There underground, nestled like silkworms in a mulberry leaf, is the witchetty grub. All fat and creamy, its hidden almond-flavoured ooze is rich with protein goodness. At eye level there’s a Grevillea bloom, pregnant with syrupy nectar, already dripping its golden sweetness on your fingers. The air hangs heavy with the heady odour of dozens of bush oranges scattered on the ground in haphazard disarray. At first glance, the desert is devoid of moisture, the red dirt scorched so dry by the sun it’s flung high into the air by the low moaning breeze. But look closer. Welcome to Doug Taylor’s desert supermarket – a place where the uninitiated can learn to fill their outback trolleys just ten minutes from the heart of Alice. Operating from the Alice Springs Desert Park, which promotes conservation and teaches how to use desert resources, Doug, or Uncle Doug given his elder status, and other cross-cultural guides throughout the Northern Territory relish their relatively new role of sharing with others how one of the world’s oldest living cultures has fed itself bush tucker for millennia. The roots of a desert bloodwood search for water in the dry earth of Central Australia. Doug’s is like no supermarket I’ve ever been in. There’s no kaleidoscope of shiny tins vying for attention, no goods positioned at head height to catch the eye, and no mindless elevator music to hold shoppers captive in a timeless plastic and neon world. In the outback, the famished must rummage for food. They must dig deep. The hunter must follow the example of the hunted; they must toil diligently and constantly for every mouthful. But those who persevere will never go hungry. The witchetty grub is perhaps the most iconic of bush foods. Up to 12cm long and 3cm wide, it lives in the roots of the Witchetty Bush and, as students from the nearby Larapinta Primary School put it on their bush tucker website, it can be tricky wriggling critter to track down. A witchetty bush, the roots of which provide a source of food for scrumptious witchetty grubs. Thousands of native bees cluster around a hive. Bush honey has a tangier flavour than most commercial honies. Our seven-year-old son sniffs loudly. Uncle Doug grabs a generous handful of native lemongrass: “Here, get a big handful, crush it up, let it soak in a dish of water for half an hour or so, then drink or gargle it. Although it doesn’t taste that flash.” The plant, which grows along the riverbank, helps clear the nose. Mulga apples hang unripened on their spiky stems at the Alice Springs Desert Park. A few steps on, Uncle Doug grabs a handful from another shrub. The medicinal apple bush is ground up and mixed with animal fat and rubbed on the chest. “Or you can use it as a pillow.” When inhaled, the vapours clear the nose. But if you do find an inviting waterhole in the Australian desert, don’t strip off and jump in – you might pollute the entire water source for the summer. “People got speared for it, misuse of water,’’ Uncle Doug says. That’s one way to enforce water restrictions. Larapinta Drive, Alice Springs. Adults $32, kids $16. Features local flora and fauna, Nature Play Area and café, Changing Heart Big Screen Movie, daily guided activities, Nature Theatre presentation at 10am and 3.30pm daily. 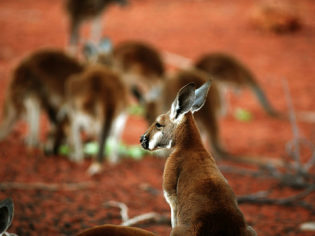 www.alicespringsdesertpark.com.au, (08) 8951 8788.